KATHMANDU, June 23: The government on Wednesday brought home the bodies of the 12 Nepali citizens who were killed in a suicide bomb attack in Afghanistan's capital Kabul on Monday. Along with the dead bodies, as many as 24 Nepalis also returned home quitting their jobs in Afghanistan. 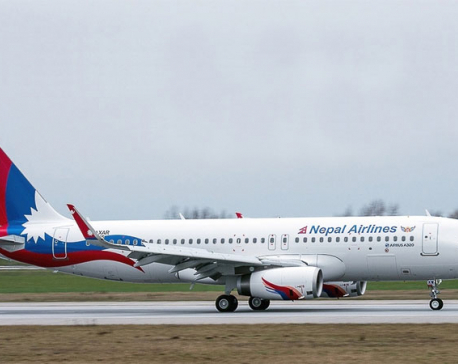 The government had sent a Nepal Airlines plane to bring back the bodies early on Wednesday morning. Prime Minister KP Sharma Oli, along with Deputy Prime Minister and Minister for Foreign Affairs Kamal Thapa, Home Minister Shakti Basnet and Minister of State for Federal Affairs and Local Development Kunti Shahi reached the Tribhuvan International Airport (TIA) to receive the bodies. All of them wore a mournful expression on their face. After the Nepali Army trucks brought the coffins from the plane to the TIA army base, Prime Minister Oli paid his last tributes to the deceased. Ministers and other officials accompanying Prime Minister also paid their last respects to the dead. After that, Prime Minister Oli, Deputy Prime Minister and Foreign Minister Kamal Thapa, Home Minister Shakti Banset and State Minister Kunti Shahi met the family members of the deceased at the airport. The family members, who travelled from various districts to receive the bodies of their loved ones, had arrived at the airport hours earlier and were waiting for the plane to arrive. 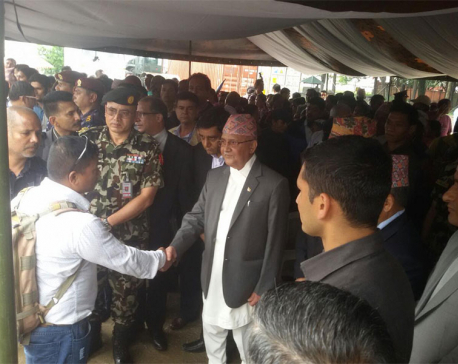 Prime Minister Oli consoled them and informed about the government's effort to bring the bodies. He informed them that the Nepal Police, Armed Police Force and Nepalese Army had been working since the morning to bring back the bodies and also informed the family members about the transportation arrangements made by the government to take the dead bodies to their respective districts. He also assured them that the government would provide necessary support to the deceased families. Later talking to media, Prime Minister once again condemned the terrorist attack which killed the Nepali citizens. He termed the attack heinous and inhuman. "I want to offer my deepest condolences to the bereaved families on behalf of the government as well as all the Nepali citizens. The government has done what it can at this stage. The government will decide on necessary support that the government can offer to the bereaved families," Prime Minister Oli said in an emotional tone. He said that the government will also think over how to bring back the remaining Nepali citizens from Afghanistan who want to return home in the wake of the incident. Prime Minister Oli also met with 24 Nepali citizens who returned home quitting their jobs in Kabul by the same plane that brought back the dead bodies. He had inquired about the working conditions in Kabul. After Prime Minister left the venue, distraught members and relatives paid their tributes to their kin. Many of them wailed in grief. The victim families thanked the prime minister for prompt response to bring back the dead bodies. Narahari Koirala, younger brother of Madhusudan Koirala, one of the dead, said that the government's prompt response has given some sort of consolation to the victim families. "It is really appreciable that the government brought back the bodies. But still, I want to request the government to support the deceased families in their livelihoods and education of their children." Madhusudan of Nuwakot who died on Monday had had lost his two children in last year's earthquake. "My brother was the sole breadwinner in the family. He has left behind four small children. They will be in miserable condition if the government does not support them," Narahari bemoaned.